Note: This question is intended to complement an earlier question on installed, desktop software. What GIS-related, or even non-GIS-specific, web- or cloud-based software/tools/services -- that are free -- do you find useful, whether for GIS development or application? For example, I'm finding that Google Docs (aka, Google Drive) increasingly useful for general productivity and Google Maps is always useful as an street atlas or as a globe. A specialized example is Q-Cogo, useful for coordinate geometry. I especially like JSBin because the entire platform is open source and you can easily download it and run it on your local machine. JSFiddle is nearly ubiquitous among web developers though -- a common response being "just make a JSFiddle" when someone asks for help with some web dev issue. 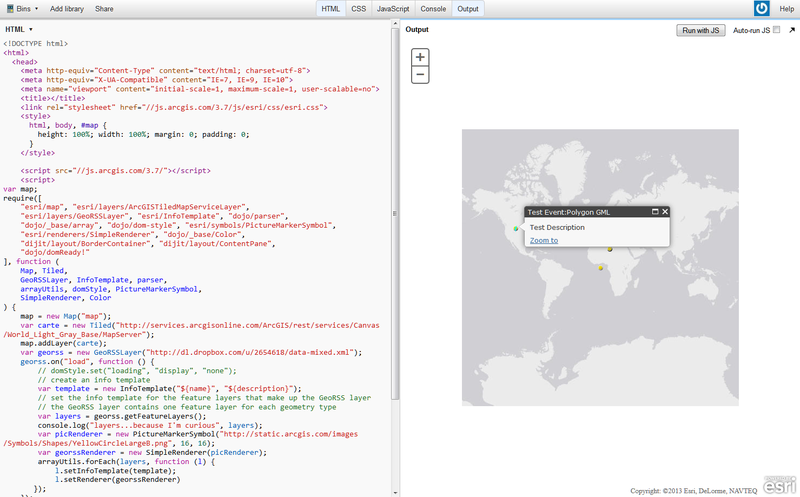 geojson.io is a quick, simple tool for creating, viewing, and sharing maps. geojson.io is named after GeoJSON, an open source data format, and it supports GeoJSON in all ways - but also accepts KML, GPX, CSV, TopoJSON, and other formats. TileMill is the design studio you need to create stunning interactive maps. To view your result, type in http://bl.ocks.org/[username]/[gist#] or get a browser extension which can use Leaflet, D3, jQuery, or anything. The site is run by Mike Bostock, creator of D3.js and is used for showing code examples. If you just want to check out someone's Gists then you can simply put in their GitHub username. Examples: GL-Solar, Rainbow Road edition by Mike Migurski, Iceland Topography by Mike Bostock. Color Brewer is a great tool for chosing colors scales. Map Projection Selection Tool is tool for chosing a correct map projection. While very limited in their presentation, Google Fusion tables have the advantage that they present a very familiar map interface if you have a broad, non-GIS user community. After all, everybody has used Google maps. Not the answer you're looking for? Browse other questions tagged open-source-gis web-service free-software cloud-gis or ask your own question. How customize GeoRSS icon in ArcGis JS API? Choosing open source web GIS software? What's the most appropriate tool(set) for creating a community map?